American singer-songwriter Aimee Mann once told me during an interview how male executives from major record labels always gave her problems when she wanted to use cover art for albums that did not objectify her. Mann eventually won her independence by buying back her master recordings, and she quickly achieved greater commercial success once emancipated. Similarly, two British women—born 63 years apart—refuse/d to be put in boxes while exploring and achieving their artistic visions in musical genres dominated by African-American men. Jazz pianist, composer, and radio personality Marian McPartland (originally Margaret Turner) was born in Slough, southeast England, on March 20, 1918, and died on August 20, 2013. Poet, rapper, and playwright Kate Tempest (originally Kate Calvert) was born in December 1985 in Southeast London. Tempest, 29, is an outspoken activist for progressive causes. It’s been said that when McPartland first came to New York in the early 1950s in search of fame as a jazz pianist, an acquaintance reportedly told her that she had three strikes against her: she was a woman, she was white, and she was British. Perhaps that famous British stiff upper lip helped her to persevere and not cower to prejudices. The proof is in the iconic 1957 photograph by Art Kane, “A Great Day in Harlem” (http://www.seewah.com/a-great-day-in-harlem/)—a testament that great music that stands the test of time can be color- and gender-blind. Marian is among the 57 notable jazz musicians photographed in front of a New York City brownstone. Standing among Thelonious Monk, Charles Mingus, Count Basie, Dizzy Gillespie, and others, to McPartland’s immediate left was Mary Lou Williams, also a jazz pianist and composer. The only other female in the photograph was jazz vocalist Maxine Sullivan. Jazz, the distinctly American art form that caught on in Great Britain between World War 1 World War 2, no doubt was helped by the influence of U.S. military men who crossed the Atlantic. Transatlantic romances during wartime were common, and the former Margaret Turner, of Windsor, England, and Yank trumpeter Jimmy McPartland met at a USO concert in Germany in 1945. Married after the war, she started using the stage name Marian McPartland and eventually settled in a New York City suburb. Jimmy introduced his bride to such genre luminaries as Louis Armstrong. The McPartlands divorced in 1972 but remarried in 1991, shortly before Jimmy’s death from lung cancer. Marian won over audiences. Top jazz vocalists, including Peggy Lee, Sarah Vaughan, and Tony Bennett sung her compositions, and she collaborated with top lyricists including Lee, Johnny Mercer, and Sammy Cahn. Although she recorded for many major labels, she also founded her own label, the aptly titled Halcyon Records. McPartland became famous in the United States not so much for her music, but through her great radio series “Piano Jazz,” which ran from 1978 until 2011. She played duets with many of the genre’s greats and conducted interviews with a Who’s Who of jazz. 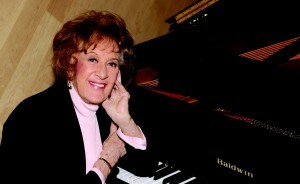 More than 700 episodes were broadcast on more than 200 stations around the world, and many of them are archived and available on demand at the National Public Radio website (http://www.npr.org/series/15773266/marian-mcpartland-s-piano-jazz/). You could take the girl out of England, but apparently not the England out of the girl, at least when jazz was concerned. Despite spending most of her long adult life in the United States, she never renounced her British citizenship and was appointed a member of the Order of the British Empire in 2010. Although McPartland sailed across the Atlantic and settled in the United States, Tempest remains a Londoner, as her fame grows in literary and music circles. In 2013, her poem Brand New Ancients won the Ted Hughes Award for innovation in poetry, and her 2014 spoken-word album Everybody Down was nominated for Britain’s 2014 Mercury Prize, the annual music prize awarded for the best album from the United Kingdom and Ireland. A humbled Tempest told the New York Times that she was “trying to smash my way into the music industry for the best part of 12 years”—much like the barriers McPartland experienced in the 1940s and 1950s. Tempest’s obvious precursor is punk rock goddess Patti Smith, who also began as a poet, in the early 1970s. Smith started public readings at St. Marks Church in New York City’s East Village accompanied by Lenny Kaye’s electric guitar, and the duo eventually expanded to a full rock band. 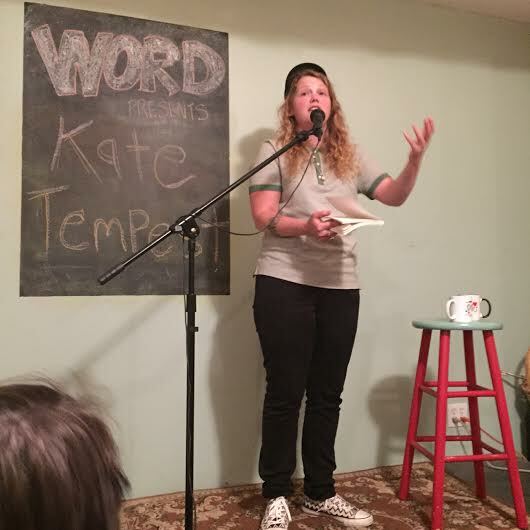 Kate Tempest WORD Bookstore Photo 3Like Smith before her, Tempest is comfortable moving back and forth between art forms. They are both wordsmiths with powerful observatory skills. Tempest’s producers and musicians are male collaborators. She counts among her wide influences writers James Joyce, Samuel Beckett, and Allen Ginsberg, as well as rappers Lauryn Hill, the Notorious B.I.G., and the Wu-Tang Clan. Her writing combines 1960’s kitchen-sink realism with a feminist-infused humanity and empathy trying to make sense of an unhinged world. At her March 26 reading at Word, a small Brooklyn bookstore to promote her first U.S. poetry book, Hold Your Own (Bloomsbury), Tempest explained that she deplores any and all forms of violence, whether it comes from a terrorist or a preemptive drone attack. Following the reading, she acknowledged to the standing-room-only audience her own awkward encounters with the homeless, trying to instill a consciousness to improve racial, ethnic, and economic inequality on an individual level if the government wouldn’t do the job. Growing up in a working-class household among four other siblings, Tempest’s father was a laborer who became a lawyer while her mother was a teacher. Kate dropped out of high school at the age of 16, feeling at home in London’s spoken-word scene. According to the New York Times article, she later finished high school and eventually received a literature degree from Goldsmiths College in London. Hold Your Own is a narrative poetry cycle that tells the story of a boy who is bitten by a snake in the woods and is transformed into a woman, and then later mysteriously moves back and forth between the sexes. While a woman, she endures physical and verbal abuse from males, who make her ashamed of her former gender. No woman’s too woman to take it all in. But fix it so subtle that no one will notice. Depending on what body s/he inhabits, s/he has various intimate and loving relationships: female-male, male-male, and female-female. He ultimately dies as Tiresias, who regrets nothing and only hopes that all could experience what he has done. If only. Tempest’s debut novel, The Bricks that Built the Houses, is to be published by Bloomsbury in 2016.